I?m on my way back from our nation’s capital to the left coast today. 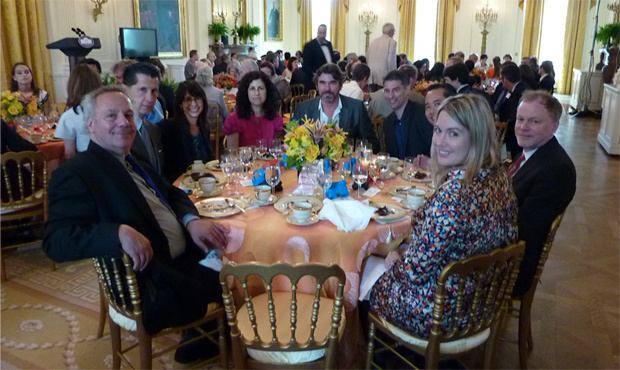 I attended the White House Luncheon for the 2010 National Design Awards hosted by First Lady Michelle Obama. In the past few years, I also attended the White House event as a “finalist” for the Product Design award but today was different–today I attended as the winner. With me were three colleagues: long time friend and Smart Design founder Davin Stowell; Dan Formosa, who has collaborated with us since the beginning; and Erica Eden, who co-founded our Femme Den initiative. Yes, today I?m proud and honored that Smart Design took the top product design award and, to state the obvious, I?m high, literally, on an airplane about 36,000 feet above the earth’s surface but, more so, lifted to new levels of optimism regarding the future of design. The day started at 8am with a Teen Design Event planned and organized by the Cooper-Hewitt National Design Museum. There, several hundred teens interested in design got to meet the designers, and we got to meet them. I was surprised by the strong attendance and enthusiasm, considering most of these kids were on summer break. What was gratifying was to think that these kids aspire to have a future in design. You know, design, one of those left brain, fuzzy, hard-to-tell-what-you’re-going-to-do-when-you-get-out-of-college type of careers. In many cases, design is the type of education or career that parents discourage their kids from pursuing. And yet today, it is being celebrated and promoted as a profession that can help solve problems and make a difference in the world. While many of the teens there were interested in fashion design (Tim Gunn was speaking, after all), I think by the end of the event we swayed a few over to some of the other disciplines. 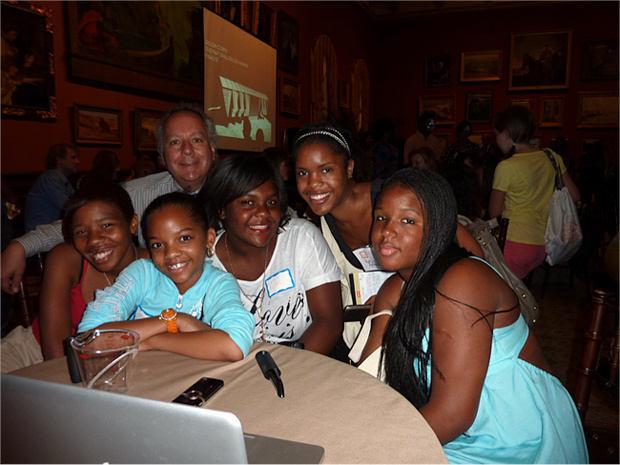 Here’s Dan Formosa with some of the kids we spoke to at the Teen Design Fair. Around lunch time we headed over to the White House for the reception. As part of the program and a special treat for me, we had our picture taken with Mrs. Obama. In meeting her, one immediately realizes how beautiful and gracious she really is?and somewhat taller than I expected. After the photo op, it was over to the East Room for Ms Obama’s welcome and opening remarks. She praised the design profession for its ability to push boundaries or even ignore them all together; as she put it, “to pursue your vision of the world as it can and as it should be.” Now I?m feeling pretty good about being a designer but it was about to get better. 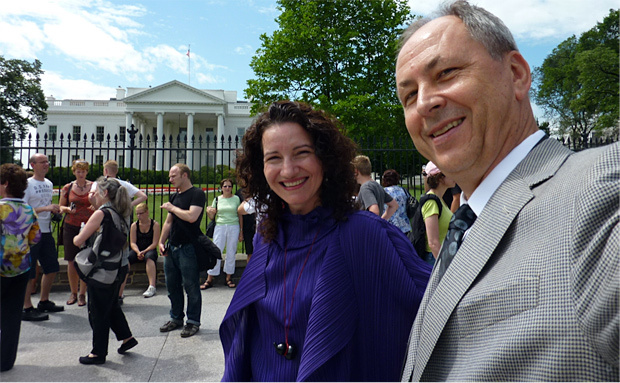 Ayse Birsel (Birsel + Seck) and me walking to the White House. She went on to quote one of the 2010 award winners saying, “Design is about people, not things.” I was stunned?Michelle Obama quoted me. It’s true, I have said that many times, but the funny thing is that at Smart Design, that’s our mantra and the quote could have come from Davin, Dan, or any number of talented folks that work there. I guess I just got lucky that it was attributed to me. Our table at the reception. Beyond the thrill of being quoted by the First Lady, now I can feel like “Design is about people, not things” is not just a mantra, it’s believable, it’s official?and it’s the truth! It’s the way we need to think today if design is going to rise above the crafting of beautiful objects, apparel, and environments to a level of understanding that all the designs we create are in service to the people that use and experience them. It doesn’t mean that we need to stifle creativity; to the contrary, it will take more creativity to find the solutions that make a positive impact in peoples? lives. That’s the challenge, and that’s the exciting thing about design and being a designer.